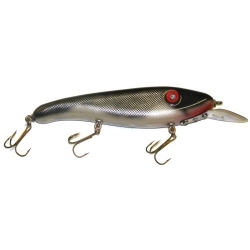 This is a large profile crank bait that can be easily cast or trolled. You will see significant tail wobble combined with body roll. This bait will troll at approximately 12 feet with 150 feet of 80 pound braided line out. To troll deeper, just attach a bell sinker to your line about 2 feet in front of the bait. This bait is available in 6 inch for high pressure water and early season and 9 inch for late summer and fall.